So said MGR’s newest member when he called our office yesterday looking to pick up his FREE Minnesota Gun Rights T-Shirt and decal. In case you forgot, in celebration of Independence Day and our freedoms as American citizens, for the entire month of July ALL new MGR memberships or renewals of $35 or more come with a FREE MGR T-Shirt and member decal! Minnesota Gun Rights is not like many organizations in St. Paul. We don’t beg politicians for our rights, we don’t worry about getting ‘selfies’ with our favorite politician after hours in a swanky bar downtown, and we NEVER betray our members in order to maintain friendships at the Capitol. Just last session, thanks to all of our members and supporters’ efforts, we forced Stand-Your-Ground through the House committee process, despite anti-gunner’s best attempts to stop us. And now, MGR is preparing a massive program for the upcoming 2018 session of the Minnesota legislature and for the election season to follow, where we gladly expose anti-gun politicians’ attacks on your gun rights. In fact, in 2016 mobilized gun owners stormed the polls and booted a slew of anti-gun politicians like former Senators Rod Skoe, Lyle Koenen and more after hearing from MGR about their Bloomberg-backed anti-gun records! As a result, Minnesota Gun Rights has become the most feared organization in St. Paul – thanks to our members who make it all possible! If you want to become a member of Minnesota Gun Rights – or renew your membership – there is no better time. If you join anytime in the month of July for $35 or more, we’ll send you a FREE t-shirt and window decal like the one pictured above. As you can see, there has never been a better time to support the work of Minnesota Gun Rights. Once you’ve joined and selected your FREE T-Shirt, please forward this email to all your friends so they can get one too! P.S. 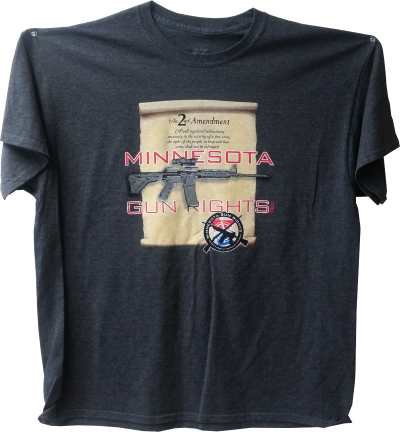 In celebration of Independence Day and the freedoms that we enjoy, for the entire month of July, we’re giving away a FREE Minnesota Gun Rights T-Shirt and member decal with all new memberships or membership renewals! If you’ve already signed up, your shirt should be arriving shortly. If you haven’t signed up yet, do so today! Minnesota Gun Rights is working, as we speak, to prepare for the 2018 legislative session and our battle to force passage of Stand-Your-Ground law in Minnesota. 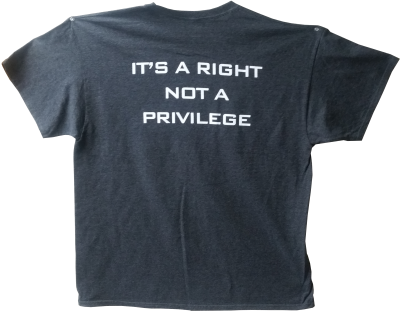 So I hope you’ll join up today, knowing that your money will go directly to the gun rights fight in Minnesota, and knowing that your FREE MGR T-Shirt will be coming in the mail shortly.